Many of our existing customers have seen improved efficiency by upgrading to a variable frequency drive. The benefits of a VFD include energy savings, better power factor, excellent motor and fault protection, as well as increased brake life and reduced wear and tear on the mechanical system through controlled acceleration and deceleration. A VFD uses less power than an across-the-line starter during starting. Check out the difference in power consumption between a 2 speed starter and a variable frequency drive. This ability to regulate speed also saves on operating costs, running the motor more efficiently. When it comes to the machine’s mechanics, the VFD provides a controlled acceleration, preventing hard starts from shocking the mechanical system. The VFD also allows for the controlled deceleration of the dumper to a stopped position, so the brakes are not worn stopping the dumper. Beyond the energy savings and reduced wear, using an “intelligent” VFD can streamline operations by allowing all drives to communicate on single network. Within the VFD all positioning and operation logic can be performed. The VFD has the ability to be programmed to replace a PLC, permitting it to be the brains and brawn of the system; calculating the dumper position and eliminating cam limit switches. There are a plethora of reasons to consider a variable frequency drive to improve unloading operations. Learn more about drive options before your next outage. 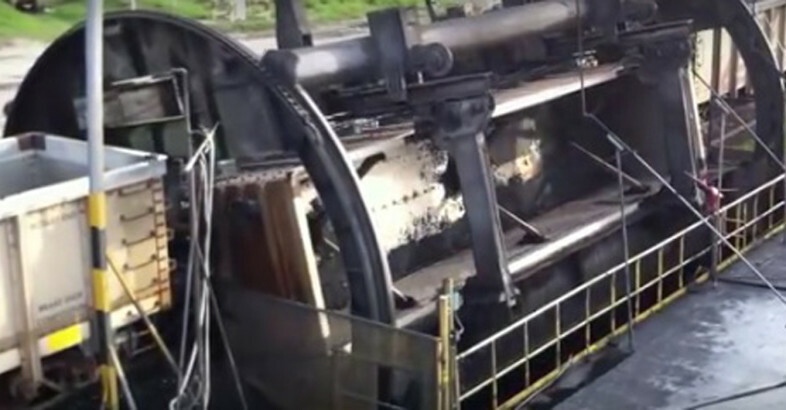 The Video shows the Single Coal Rail Car Dumper – Santa Marta Colombia by Heyl & Patterson. This Single Rail Car Dumper has been in operation over 15 years.